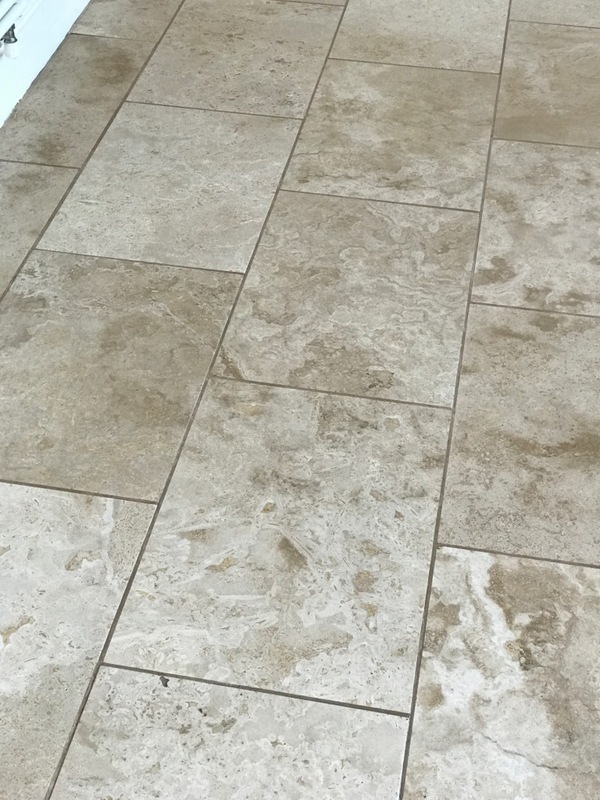 This customer from Swansea was unhappy with the look of her Travertine floor tiles and so decided to call in tile doctor after she had seen pictures of other travertine floor tiles on one of our websites and wanted hers to look the same. The natural brown shades of her own Travertine tiles had become very dark and were looking dull and lifeless in comparison. It was clear to me that the Sealer was wearing thin with use and dirt had now penetrated the pores of the stone making it difficult to clean effectively. 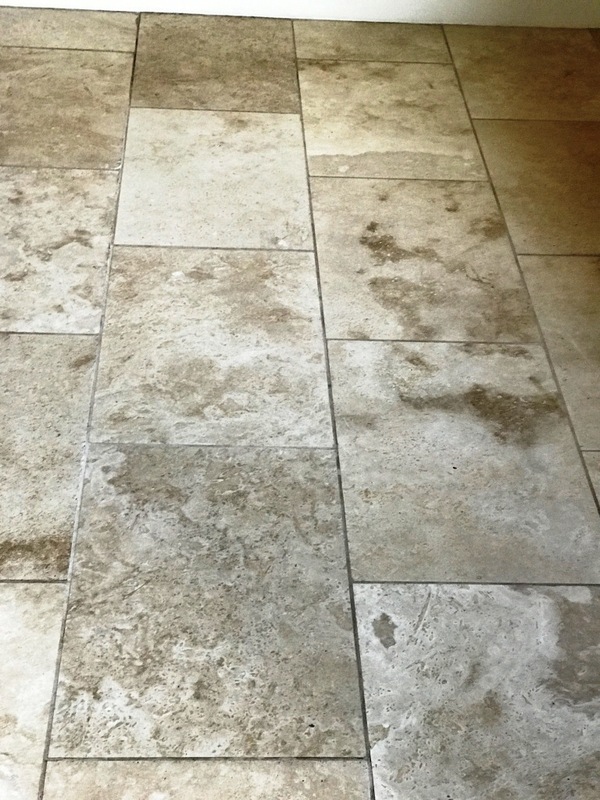 This is a common problem with stone floors and this is why Tile Doctor offer a maintenance service where we pop round once a year to top-up the sealer on your floor. To restore the polished appearance of the floor the stone would need to be stripped of any remaining sealer and dirt, re-polished and then sealed; we find the best way to achieve that is through the application of a set of Diamond encrusted burnishing pads. I started the burnishing process by fitting a coarse 400 grit no.1 burnishing pad to a floor buffer and running at a slow speed ran the pad across the whole floor. This coarse pad is designed to strip off old sealers and dirt from the tile. You use a little water to help lubricate and once complete it’s necessary to rinse the area with water to remove the soil that is generated. The next step is to start building back the polish with the 800 and then 1500 grit pads which are applied in the same manner. The floor was then rinsed again with water and I turned my attention to the grout which was scrubbed by hand using Tile Doctor Pro-Clean and a stiff brush. The floor was given another rinse and then inspected to ensure I hadn’t missed anything. Before leaving for the day I used the wet vacuum to extract as much moisture from the floor as possible. On the second day I finished the banishing process with the application of the final of the four pads which is a very fine 3000 grit pad which adds a final polish to the surface leaving it looking shiny. This last pad is applied with a small amount of water spayed onto the tile in a process we call a spray burnish. The use of water is so small the floor remains dry enabling us to apply a sealer shortly afterwards. 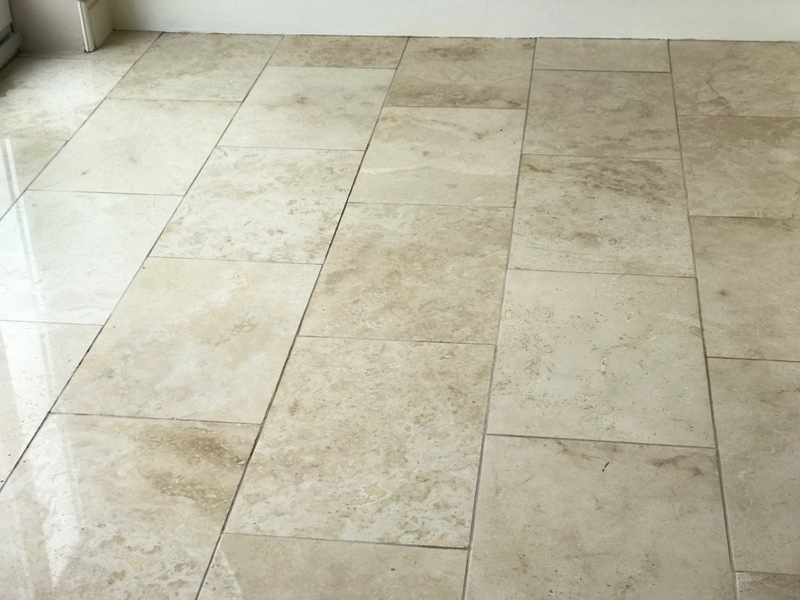 There are some beautiful brown shades in Travertine and so to really make them standout I sealed the floor using a couple of coats of Tile Doctor Colour Grow which is a colour enhancing impregnating sealer that soaks into the pores of the stone protecting it from within. The sealer will also make ongoing cleaning and maintenance easier for the customer. The customer was very pleased with the result and commented on how clean and deep the shine had come out using the Diamond pad system. Before leaving I recommended the use of Tile Doctor Stone Soap as an aftercare cleaner, this produce is specially designed for cleaning polished stone, not only does it helps build patina, but it won’t prematurely erode the sealer like many acidic cleaners you find in the supermarket which should really only be used on ceramics and Vinyl tiles. 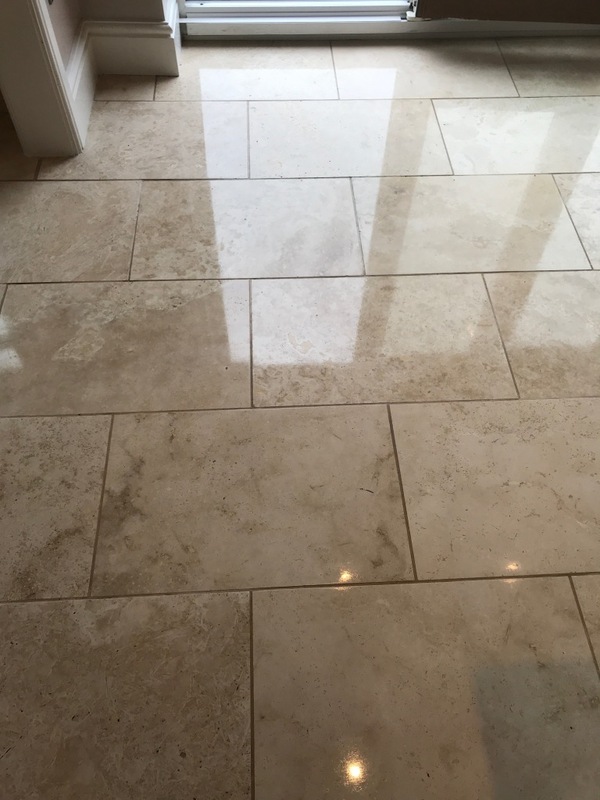 This entry was posted in Work History and tagged Glamorgan, grout cleaning, Honed Travertine Polishing, South Wales, Spray Burnish, Stone Polishing, Swansea, tile cleaning by AbzDominise. Bookmark the permalink. Covering Swansea and the surrounding area Creighton Foyle is an agent of Tile Doctor, the largest Tile, Stone and Grout restorative cleaning network in the UK who have developed the products and techniques to handle a multitude of issues surrounding tile, stone and grout restoration.